Where to use aerial advertising | Paramount Air – Aerial advertising banners that get noticed! In a world where we are constantly bombarded by media, it can be easy to dismiss regular, everyday advertising. We instantly click off of pop-up ads online, and even learn to ignore billboards. That’s why it’s essential for businesses to find another way to get their message seen. 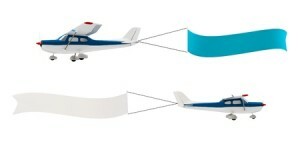 Aerial advertising offers a unique, creative way to capture an audience’s attention. But where can you utilize this form of advertising? Paramount Air Services is based in Cape May County (since 1945). There are offices available along the Delaware Bay in Green Creek. Paramount even has its own airfield with hanger. We can fly the entire coastline of New Jersey (from Cape May Point to Sandy Hook beach) for regional and national advertisers. We also offer local businesses the ability to get a message across between Cape May Point and Brigantine. Although aeriel advertising is often seen at the beach, it’s not the only place to advertise. You can use this form of advertising at events (entertainment, fairs, community etc.). It’s also a great option over amusement parks, water parks, and picnic areas. You can even advertise during rush hour traffic or by busy freeways. When your message is being pulled by a plane, it’s easy to be seen by a large audience. You can broadcast your message in a unique way that stands out from billboards and the mundane everyday advertising.